At 4 a.m., I woke up to the sound of my alarm. Normally, I would hit snooze several times, but not this morning. I was too excited to go back to sleep and I could smell the bacon cooking in the kitchen. Montana was unusually warm for the first day of the hunt, but coming from Alabama, it was still chilly to me. I threw several layers of clothes on, grabbed my .30-06 Remington 700 AWR topped with EOTech’s 2.5-10 x 44 Vudu Precision Rifle Scope and headed out the door with my guide, Jeff. Let’s back that up a minute: I love hunting, but also I love fashion and makeup, so I have to admit I did get up a little early to make sure my hair and makeup were good to go – no shame in my game! Back to heading out the door with my guide, Jeff… While still dark, we drove for fifteen minutes on a narrow path winding through the ranch property. It would lead to the mountainside we would soon climb. With great anticipation we put on our backpacks and slung our rifles over our shoulders. We started our hike. This hike would soon prove much harder than I expected. I work out on a consistent basis and have hiked many mountainous trails in the past, but one thing I didn’t realize was how much elevation impacts a body. Having been in Montana less than 24 hours, my body didn’t have time to become acclimated to the higher elevation. Less oxygen available made this hike harder than other ones I’ve done in the past. I hate to sound like a wimp, but I did stop a few times to take quick breathers. While catching my breath, we glassed for elk and soaked in all the beautiful views, including the sun rising amidst the super moon setting – breathtaking. We eventually arrived at an area with a great view of the mountainside and the open land where we hoped the elk would pass through. After chatting over a quick snack, we spotted a herd of elk. I got excited, but unfortunately they were not within our range. Shortly after spotting the herd, we saw others from our group of hunters sneaking up on them; in fact, they were crawling through a pasture with hopes to get close enough to take a shot. Eventually, the sound of a rifle shot rang through the air. I have to admit I was slightly disappointed that I wasn’t the one shooting, but I was excited for my fellow hunter, Mark. Later in the day we returned to the ranch. I was looking forward to hearing Mark’s story. His adrenalin still appeared to flow as he told his story over dinner, making me all the more anxious to get back out there the next day. I knew I was hooked when I wanted to get up at 4 a.m., again! We spotted this beauty on the drive back to the ranch. Lucky for him, I didn’t have a deer tag! Morning came and I managed to wake up before my alarm clock went off. That’s pretty out of character for me, but I was ready to get back out there! The temperature was much cooler than the day before, but I was layered up and ready to take on the cold. Quickly, Jeff spotted a herd at the base of a bench (what most of us Southern people would call a hill). After a long hike to the general area of the elk, we noticed that the wind began to change direction, creating issues for us. Elk have a stronger sense of smell than I might have guessed and can detect your scent if the wind is blowing toward them from your position, even if your position is pretty far out. I tried to be patient and wait for the wind to favor us; however, it continued to constantly change – making it almost impossible to sneak up on the herd. With no chance of consistent wind in the right direction, we decided to head back to the ranch for lunch. Jennie, the camp cook, had prepared a hot lunch that was much needed after being in the cold wind all morning. As the day went on and the temperature dropped, I could feel the moisture in the air from the snowstorm headed our way. After lunch, Mark said, “Good luck this afternoon in the cold and get prepared for tomorrow, as it will be much colder.” Quickly, I responded with confidence, something along the lines of, “Today is the day!” This hot weather girl wasn’t ready for the cold and snow tomorrow! Determined to get an elk that afternoon, Jeff and I headed out once again. The herd we found earlier in the morning remained in the same general area; however, the wind – although bitter – blew in a consistent direction. We approached from a different location this time, a short walk and a quick climb up a bench. Once we made it to the top of the bench, we appeared in the herd’s view, so we had to crawl slowly and quietly until we could get close enough to take a shot. We reached a good position, the herd stood in a line and I spotted the elk that I planned to harvest. As I got into shooting position, my elk began to walk up and down the herd, preventing me from taking the shot. With another elk was always behind him I just couldn’t take a chance on getting two elk with one bullet and only one tag. After what seemed like forever (it was probably only 20-30 minutes) I finally had a clear shot at 260 yards and only minutes left of good shooting light. I had loaded my rifle with Remington Core-Lokt ammo. Focused intently through my EOTech Vudu Precision scope, I waited for a break in between wind gusts. Then it happened! I pulled the trigger and within seconds saw him drop. The herd started to run away, but briefly came to a stop and glanced back. The wind blew so strongly that they were unable to determine what direction the shot came from. As we started to approach the herd, they left in a hurry. Jeff and I felt proud of what we accomplished, but most importantly I was thankful. Not only would I have delicious meat for my family, it would now be my turn to tell my hunting story at dinner! Put this kind of a hunt on your bucket list, it was truly the adventure of a lifetime! 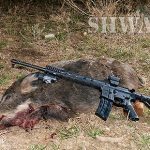 This entry was posted in Special Guests, Honorary SHWAT™ Team Contributors and tagged .30-06, Adventure, Elk, EOTech, Hunting, Long Range, Remington, Women by guestwriter. Bookmark the permalink.